In the nineteen seventies and early eighties television was very different than it is today. First, there was just three channels. That’s all, just three. It seems quite inconceivable that this could possibly be the case when faced with the huge number of channels that we have now, but it is true. BBC1, BBC2 and ITV1. Channel four was just a dream. The rooftops of Britain were festooned with TV aerials all hoping to be pointed at the London transmitter for their TV shows rather than the local one. It didn’t matter where you were Skegness, Cardiff, Edinburgh or Bath TV aerial installation was the most important way to get a good signal. Its still true today with digital and if you are having a few problems then a visit to http://steveunettaerials.co.uk/services/tv-aerials-repair-installation-bath/ will soon see you right. To further compound the issue the three channels decided that they needed a bit of break in the middle of the day so, unless Golf or a Test Match was on, Television stopped after Pebble Mill at One and then Bagpuss or Trumpton at Quarter to two. It didn’t come back on again until about quarter past three when it the school kids came home. What was on in between? The riveting and enthralling test card that’s what! The BBC in its wisdom was worried about your TV. As a result, it decided that in the mornings from about eight am to five to ten, the afternoon slot and close down after twelve am that it should broadcast a card that told you if you’re TV’s reception and screen was working properly. To start with the card was black and white but on 2nd July 1967, when colour was first transmitted, the BBC made the dramatic move to Test Card F. This was a historic day for broadcasting as it featured a person. This was an eight-year-old called Carole Hersee playing a game of Noughts and Crosses with a toy clown called Bubbles. 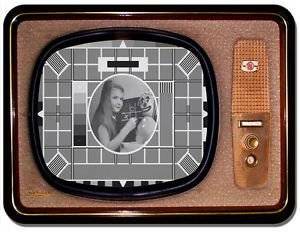 Carol (and Bubbles) were to feature on the Test card for the next thirty-two years. It was removed in 1999 and a now forty-year-old Carol could no longer say she worked in Television. The card was accompanied by soothing muzak or light jazz. If you stared at it long enough, you’d swear that Carol moved or that the X and O were in the wrong place. When televisions rIn the nineteen seventies and early eighties television was very different than it is today. First, there was just three channels. That’s all, just three. It seems quite inconceivable that this could possibly be the case when faced with the huge number of channels that we have now, but it is true. BBC1, BBC2 and ITV1. Channel four was just a dream. The rooftops of Britain were festooned with TV aerials all hoping to be pointed at the London transmitter for their TV shows rather than the local one. It didn’t matter where you were Skegness, Cardiff, Edinburgh or Bath TV aerial installation was the most important way to get a good signal. Its still true today with digital and if you are having a few problems then a visit to http://steveunettaerials.co.uk/services/tv-aerials-repair-installation-bath/ will soon see you right. To further compound the issue the three channels decided that they needed a bit of break in the middle of the day so, unless Golf or a Test Match was on, Television stopped after Pebble Mill at One and then Bagpuss or Trumpton at Quarter to two. It didn’t come back on again until about quarter past three when it the school kids came home. What was on in between? The riveting and enthralling test card that’s what! elied on analogue wave systems the test card was a brilliant way of changing the setting on the TV so that you could get the best optimal picture an art lost to the perfect point and click digital TV we get today. It was replaced by 24-hour television on BBC 1 and pages from CEEFAX on BBC2 (which was subsequently replaced by the internet). 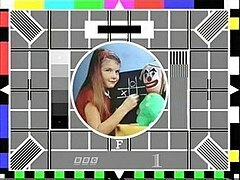 An urban legend states that at some point the unthinkable happened and the test card fell off it’s A frame in a freak gust of wind to reveal two BBC engineers enjoying a game of cards and a smoke.